Abri édifié en 1966...! Vu l'isolement et le climat, ça peut être utile. Confort ressemblant à celui d'un orri, quoique sûrement un peu moins (bien qu'il y ait une porte. Davy’s Bourach’s is a bit like Marmite; you will either love it or hate it. 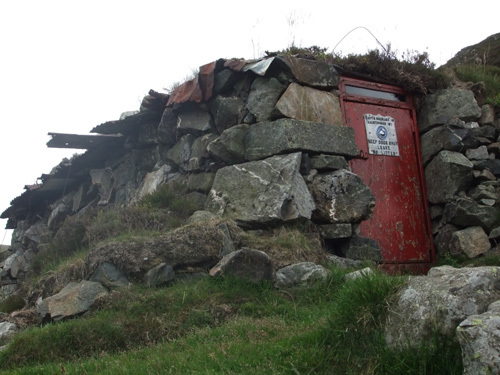 For some, like myself, the prospect of spending a night in this mountain refuge is an exciting one. Others, however, would prefer to crawl beneath the nearest boulder. Built in 1966 by man of the mountains Davy Glen, the stone, turf and corrugated iron howff is not the most salubrious of joints, but it was not intended to be a place where you choose to spend the night, rather it was a safe haven for those caught out on high ground by rapidly changing weather conditions or misfortune. As such, it has done its job well, saving quite a few lives over the years. 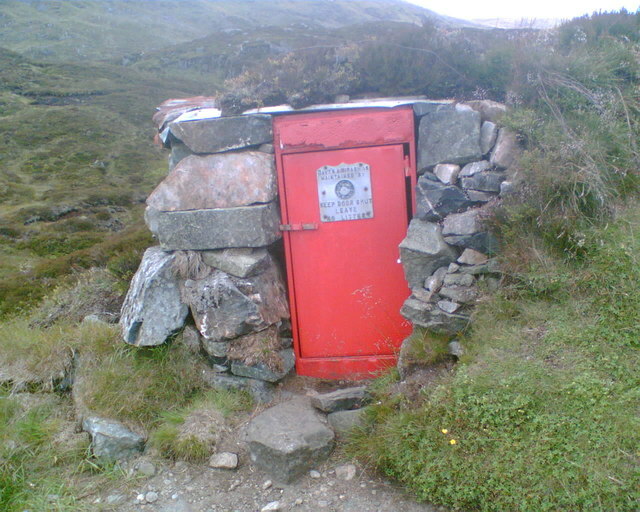 Accessed via a red metal door, the bothy consists of a single room with hard earth floor beneath a low ceiling. There is no fireplace and no furniture, other than some wooden planks and a spade for al fresco toilet duties. The real joy of Davy’s Bourach is its position. Located on Jock’s Road, the highest of the ancient routes crossing the Mounth, it is within easy reach of a clutch of Munros, including Tom Buidhe, Tolmount and Cairn of Claise. Davy’s Bourach may not be everyone’s cup of tea, but if you run into bad weather on the high plateau, you will be very glad of its existence. ACCOMMODATION: Davy’s Bourach (GR: NO 232778) sits on Jock’s Road, four miles walk from the car park and ranger centre in Glen Doll.